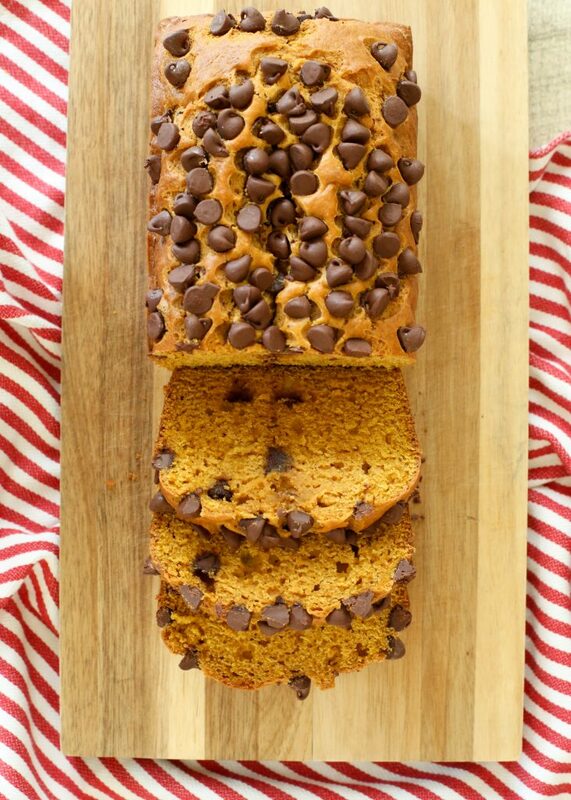 Chocolate Chip Pumpkin Bread is filled with melting chocolate chips and bursting with autumn spices. Is there anything more quintessentially fall than the smell of pumpkin spices drifting through the house? 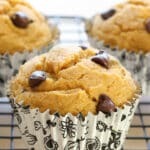 I have no idea how I survived up until then without this awesomeness in our life, because pumpkin muffins have been a year-round (yes, pumpkin haters – year round) favorite in our home ever since. 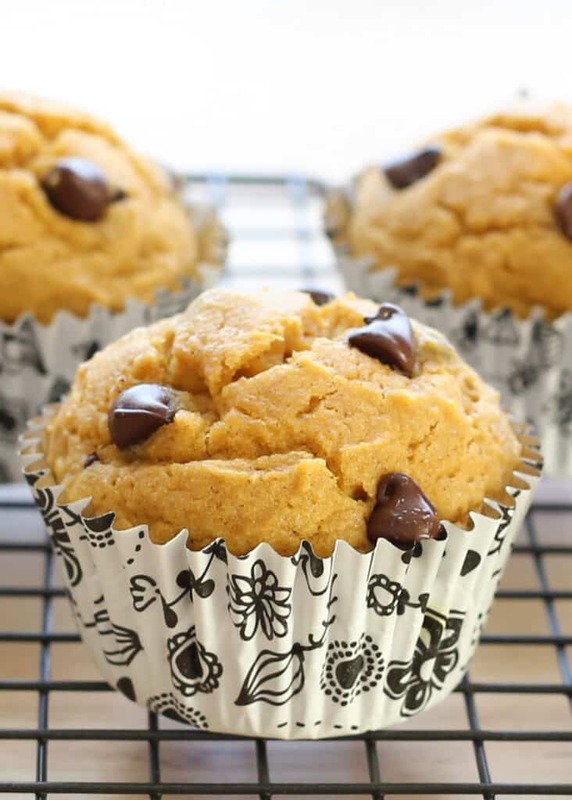 Pumpkin bread and muffins are certainly not just for fall. You’ll find a can of pumpkin in my pantry January – December. 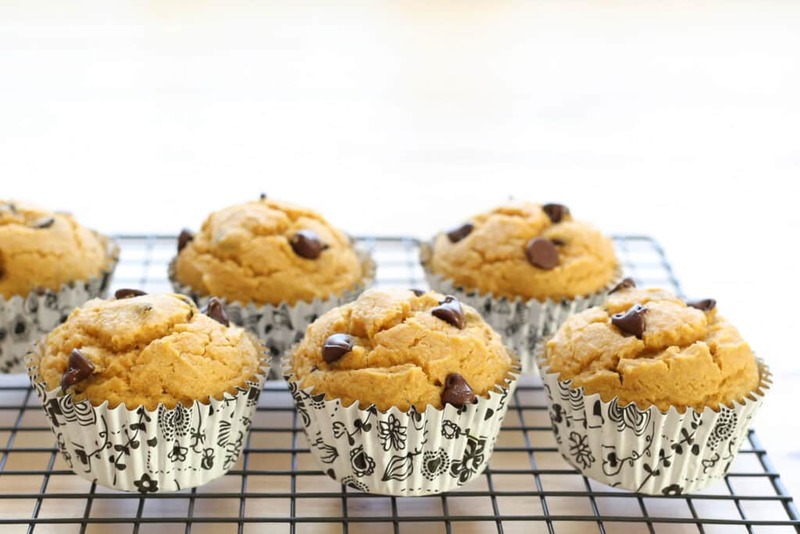 Because pumpkin muffins are a delicious wonder that shouldn’t be relegated to holiday baking alone. That said, you might also find me making Pumpkin Mousse, Layered Pumpkin Cheesecake Pie, Pumpkin Coffee Cake and endless other delicious things from a lovely little can of pumpkin puree. 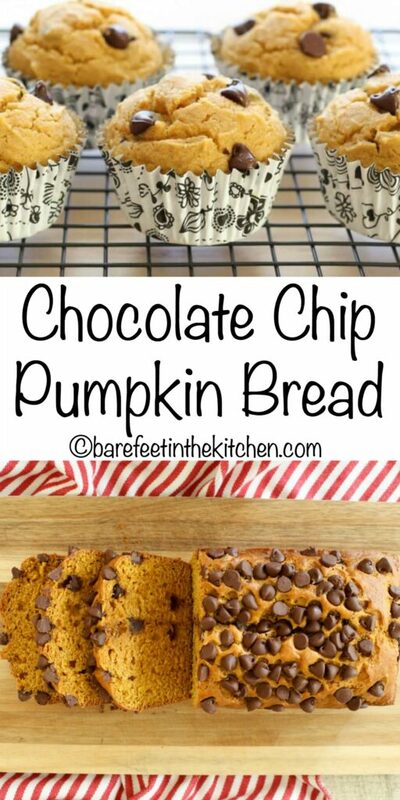 Want to start your day with some more pumpkin deliciousness? How about Pumpkin Pancakes, Pumpkin Waffles, or this Pumpkin French Toast Casserole? Bring on the fall weather, I’m ready for it all. Preheat the oven to 350 degrees. Grease muffin tins, loaf pans or line with paper liners. Stir together the flours, sugar, spice, baking soda, baking powder, and salt. Add the pumpkin and mix until smooth. Stir in the eggs and the oil and mix again until combined. Stir in 1/2 cup chocolate chips. Pour the batter into (2) loaf pans or scoop into muffin cups (about 2/3 full). Scatter the remaining chocolate chips over the top of the muffins or loaves. Bake muffins 16-18 minutes, loaves for 50-55 minutes, until toothpick inserted comes out mostly clean. Let the bread cool completely and store in an airtight container for a few days or freeze for up to 3 months. Enjoy! If you'd like your gluten free muffins to be more perfectly smooth on top, add 1 teaspoon of xanthan gum to the flours in the recipe. I couldn't care less if mine look cracked or imperfect, so I skip the ingredient that adds nothing else to the flavor or texture. I have made the muffins both ways to test it, and the gluten free muffins hold together perfectly without the xanthan. 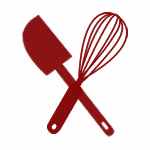 Don’t miss the rest of the Gluten Free Recipes on this website! « Cheese Plate Snacks & A Cheesy Giveaway! We love pumpkin! Thank your sharing these with us, I will be making these this week! Just made these and ate one hot out of the oven with a hot cup of tea. So delicious! I did make the gluten free version and my husband didn't even have a clue they were GF! Question...the recipe states to bake 16-18 minutes for the muffins but it doesn't mention the time for a loaf? Maybe 45-50 minutes? Thank you! 45-50 would be my guess as well. I'll make a note of exactly how long it takes next time I bake this as a loaf pan!